Microsoft PowerPoint 2010 gives you more ways to create and share dynamic presentations with your audience than ever before. Exciting new audio and visual capabilities help you tell a crisp, cinematic story that’s as easy to create as it is powerful to watch. With new and improved tools for video and photo editing, dramatic new transitions, and realistic animation, you can add polish to presentations that will captivate your audience. 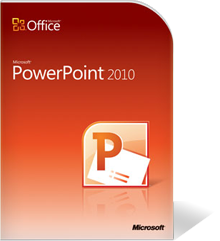 In addition, PowerPoint 2010 enables you to work simultaneously with other people or post your presentation online and access it from virtually anywhere using the Web or your smartphone. PowerPoint 2010 offers new, dynamic slide transitions and animation effects that look similar to graphics you’d see on TV. Easily access, preview, apply, customize, and replace animations. You can also use the new Animation Painter to easily copy animations from one object to another.